Do The Reproductive Rights Of Afghan Women Rest With Religious Men? Afghanistan holds the distinction of having of the highest fertility rate per woman in Asia - the average woman will bear six children in her lifetime. As the nation struggles, hope has shifted to the Mullahs to encourage reproductive restraint. Afghan women who work for Marie Stopes [International, a sexual and reproductive health NGO], distributing birth control door to door in the country's capital, have also noticed an interest. An overwhelming majority of people are still skeptical of their motives. (Foreign spies! Christian missionaries who want to reduce the Muslim population!) But a growing number are open to the idea. "Sometimes they are kind of surprised that this kind of thing exists," said one of the workers, a woman named Aziza. In 2009 alone, the sale of birth control pills nearly doubled to 11,000 in September from 6,000 packages in January, according to Marie Stopes figures. One woman was so happy to have birth control pills that she hugged and kissed Aziza, ripped open a package and swallowed a pill with a gulp of water. "She said she didn't want to wait until evening," Aziza said, laughing at the memory. The total number of the woman's children: 17. Three dead, 14 living. The most difficult families are ones headed by mullahs. Aziza and her colleagues tread carefully in those households. Mahmouda, another worker, recalled walking into one such house and finding the mullah's wife washing clothes and trying to calm a baby. She signaled silently that Mahmouda should talk in a low voice. "‘If my husband finds out, he'll punish me,' " Mahmouda recalled the woman saying. " ‘I'm pregnant now. I really need those pills.' "
Taking birth control in secret is not unusual, the women said. Even Aziza's own husband opposes her using it. "He said, ‘We are Muslims and God gives us babies,' " she said. The underlying idea that lowering Afghanistan's fertility rate would help it develop economically makes a lot of sense. Especially in an overwhelmingly rural country, the tendency is for a rapid increase in population to lead to falling living standards. That said, the specific method of trying to do this by talking to male religious leaders about birth control seems to me to be at odds with most of what we know about this subject. As a recent Economist story on fertility trends emphasized, women in the developing world generally have more children than they want to. When we see falling fertility rates, it's normally a result of women being empowered to make more decisions about their own lives. Those who oppose [birth control] sometimes get violent. Aziza recalled people running her out of a neighborhood in Kabul after she introduced birth control there. They accused her of being on the payroll of the Americans, taking dollars to weaken the country.
" 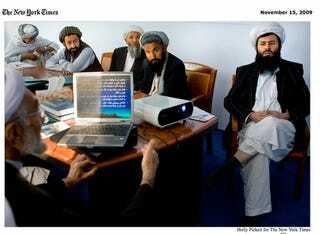 ‘They want to capture Afghanistan,' " she recalled that they said. " ‘If the Muslims are many, they won't be able to.' "
In addition, many women - particularly women of color - have cause to be skeptical of organizations promoting birth control and abortion. Stopes, like her American counterpart Margaret Sanger, embraced eugenics which has often been used as a justification to reduce the number of people of color, poor children, and people with disabilities through selective breeding. While there is no easily traceable evidence that Sanger or Stopes supported forced eugenics, a la the Nazi party (indeed, Sanger wrote often against such a thing, arguing that change must come from within a community), the idea of birth control as unwanted population control still resonates to this day. Looking specifically at the current situation of women in Afghanistan, however, allowing women to choose their own reproductive destiny will be an important tool in helping the country to rebound. And the participation of Mullahs may increase the chances of success - if only to help persuade some God-fearing women that adopting a different way may actually be in their best interest.